The Mysterious Packages... - Ramblings of Mad Shutterbug & the Border Collie Bros. Since I am nattering on about Mysterious Packages, it should be obvious to you, Oh My Reader, that I intend to enlighten you about these at such time as it is both convenient and somewhat detailed. 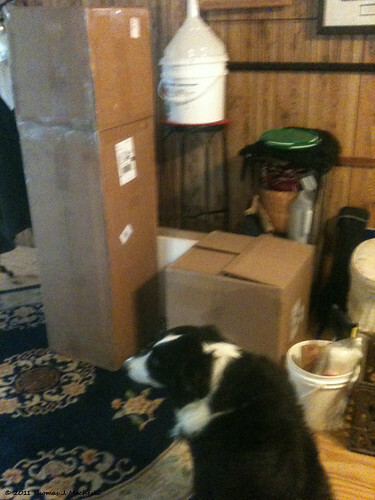 The two 'mysterious' boxes, one tall and relatively skinny, the other cube-shaped, with Houdini BorderCollie Bro for scale comparison, arrived yesterday via UPS (as previously mentioned). What I've not mentioned is the source of these Mysterious Packages. I'm also cheating like hell, because I already knew the contents and saw photographs of the contents (mostly). The delightful Swears Like The Sailor She Is slave2tehtink recently acquired these items. Through portions of the tale which are mine to tell because they are not filtered, these are items she recognises the value thereof, the craftsmanship thereof, and that she is unlikely to be using for a variety of reasons. She feels strongly that they need to be with someone who will also appreciate the value, craftmanship, and is likely to use them rather than with her. Also, and I quote (you've been warned already) THEY ARE F*CKIN GINORMOUS AND I WANT MY DAMN SPACE BACK. The other portions of the tale to which I am privy are not mine to tell you. Nor will I. Tough. Still and all, here (behind the cut, more for bandwidth than for any Adult Content aspects) is the rest of the tale, visually and textual. Ah! 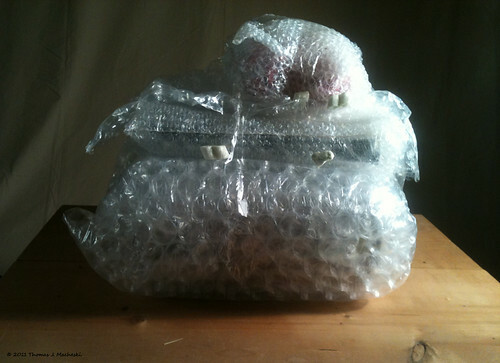 A big blob of bubble-wrap and other plastic, which formerly rested inside a cocoon of styrofoam packing peanuts. Ah! 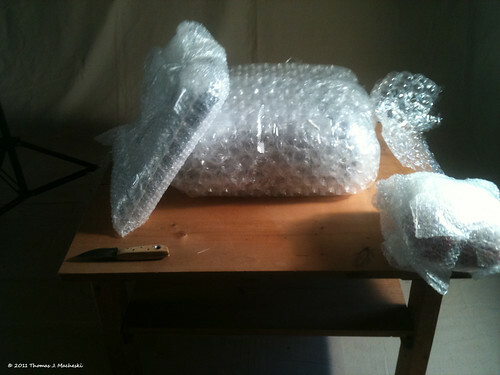 THREE blobs of bubble-wrap and other plastic, which formerly rested swaddled together inside a cocoon of styrofoam packing peanuts. 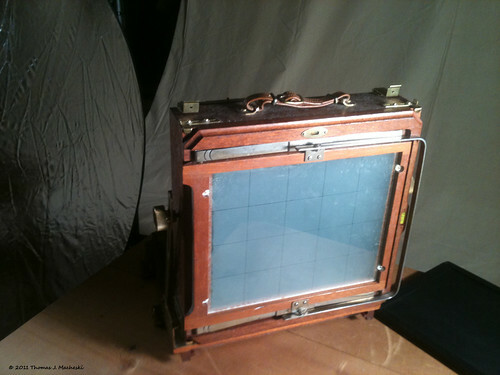 Camera, Lens & Mount, 2 film holders (total of 4 sheets of film), lens wrap cloth which doubles as ground-glass shield for focusing. Camera? 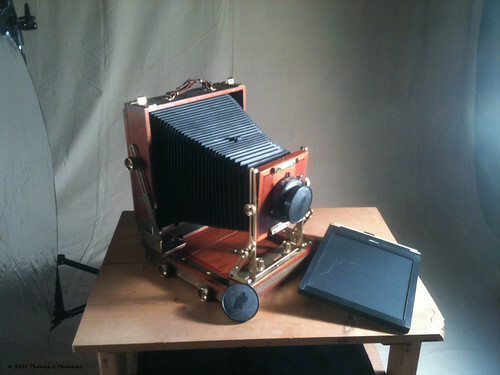 Yes, this is a Zone VI field camera, of the genus View Camera. Now, for sheer hilarity of things, this morning because My_memory told me 4x5 I spent browsing through one of my favourite photography supply houses for 4x5 sheet film. This despite, once seeing the camera, My_memory says to Myself, Oh, Hai, Yes. Not 4x5, 8x10. As in, an 8 inch by 10 inch sheet of film. The lens is a Schneider-Kreuznach G-Claron 9/355 made in Germany, so an f-9 largest aperture 355mm lens. Still researching the relationship of the size to the format. Lens this size sold recently on e-Bay for 90 pounds sterling, without shutter. 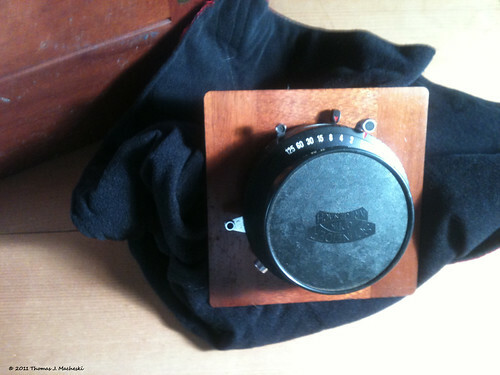 In these cameras, the Shutter is a separate entity and this one is a Copal No. 3 f Bulb (wide open so long as held) - 1/125 second made in Japan. Set out for overall size comparison. Camera needs a good cleaning, as does the outside of the lens/shutter. The shutter sounds good, with a one second setting sounding like a one second click. 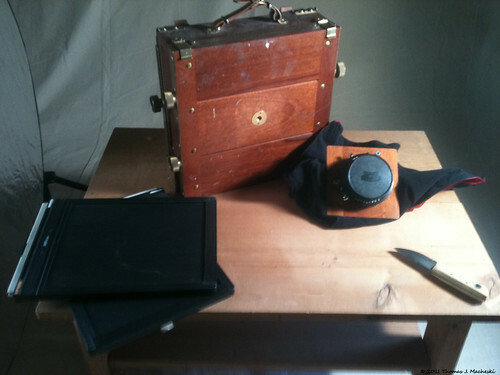 The bellows are supple, and no obvious light leaks. I'll need to check that later, in more detail and under some controlled conditions. 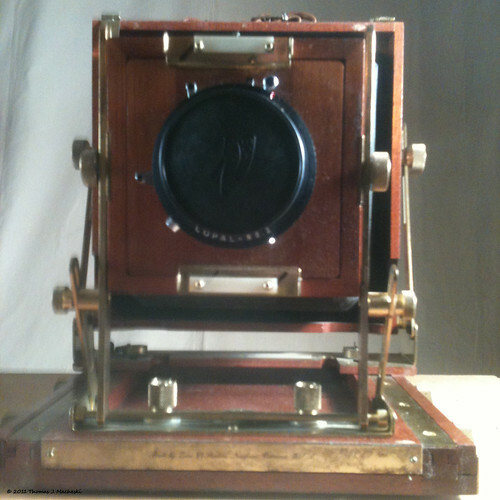 The two film holders may well still be holding film. One of them, at least, is, because I cracked the dark slide just a bit, slamming it shut again when I saw the grey surface of emulsion and the notches which orient the photographer as to which side is up when loading the film into the holders. The back re-orients for either Portrait or Landscape orientation. 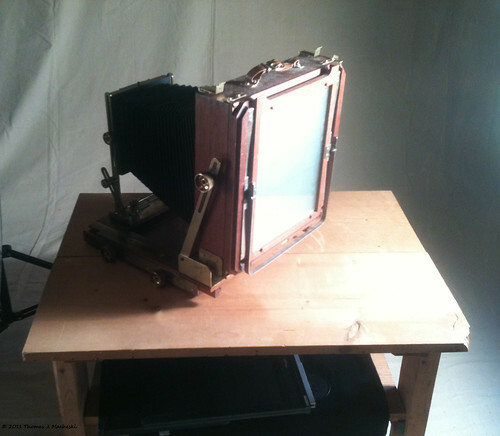 While not difficult to do, it requires a spot of time, as do all the rest of the setup aspects of a view camera. The general rule of thumb amongst photographers/cameras is, the smaller the format the faster one shoots. By this, I mean DSLR or FLSR (Digital, Film) in '35mm' sizes is fast work, Medium Format (again either D or F) is a bit slower but still can be fairly rapid, and Large Format is... not so much fast. There is a tripod which came with this, made of wood and metal, and intended for outdoor use. It is in good shape also. Why intended for outdoor use? That would be due to the three GINORMOUS (yes, S2T, I use your words for this too, as they Fit So Well) SPIKE THINGIES on the feet of the tripod. The truly great news is, there is a mounting plate on the tripod head, quick release, which fits the heavy studio tripod I use as well. So, View Camera will be useful both in and out of Studio 318. For now, though, first a good cleaning with a damp cloth, then a light check. Then... take the existing film in for processing to see, is it exposed, or test expose on it simply because it's at hand? This is partially a rhetorical question. And yes, oh my yes, slave2tehtink, You and Tink do get your portraits done, in period clothing of your choice, printed, mounted, matted, framed. Oh yes, yes you do. Re: how long has the film been there, the answer is *years*. The camera hasn't been used since 2005 at least, and probably more like 2000. I suspected, based on other conversations, eh. Is one of the reason it is somewhat rhetorical a question. May take in 1 sheet to be processed, expecting it will be unexposed. However, don't know the storage conditions in the holders. But yeah, I wouldn't expect there to be anything worthwhile on the film! and tell Houdini we have more border collie cousins! seven of them!